Most of my first twenty years of life, beginning in 1947, was spent in the South part of Fayetteville where I lived in rental houses on S. College Avenue, East 5th Street, and (I am told because I was too young to remember) S. Washington Ave. I also lived briefly in City Housing (Block Ave. near Archibald Yell Ave) and, for many years, starting in 1955, in a house on East 6th Street, a block down the hill from Jefferson Elementary School. In those years, South Fayetteville (bounded by Archibald Yell Ave, S. School Ave., 15th Street, S. Wood Avenue, and Huntsville Road) was my turf. 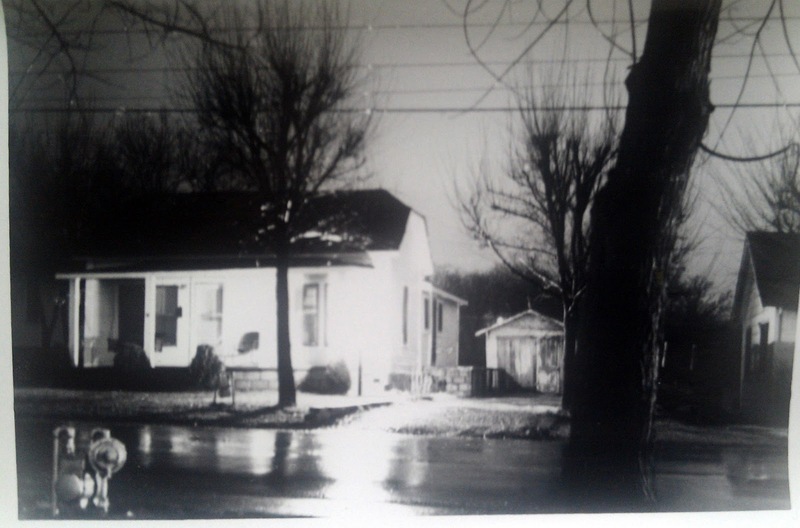 South Fayetteville in the 1950's and 1960's was populated predominately by lower middle class families, most residing in modest, well-kept houses. Some streets had a sprinkling of larger, older homes. A few tracts of land contained large houses or mansions (for example, the Walker House, off S. College Avenue, near Jefferson was a big historic house surrounded by a large amount of land). Several neighborhoods had mainly tiny houses inhabited by poorer people. The nicer part of Fayetteville, with the bigger and more expensive houses, was located to the north and northeast of the downtown. Housing for middle and upper middle class families were to be found near the University, around the City Park, and in the vicinity of the Veterans Administration hospital. The land along and north of East Dickson contained historic two-story Victorian style houses that dated to the early days of the city. The east-side mountain contained some mansions that were visible from the city’s flat lands. In those years, new housing developments on the edges of the core city were on their way, but had barely begun. Most of those suburban houses with big yards would be built to the northeast and northwest of the city center. And while Fayetteville was to grow in the coming years, comparatively little of the growth was to take place in South Fayetteville and the areas surrounding it. During my time in South Fayetteville, it was inhabited largely by families whose income came from blue collar, clerical, or service industry jobs. Also, many older people lived there. Few university faculty members or other more affluent professionals lived in South Fayetteville. (When I was attending Jefferson grade school, I heard rumors that the city had a university, but it was some years before I was first on the campus.) Also, South Fayetteville contained few black families, though Robert Wilks and his family lived on 6th Street, east of Jefferson School. Most black families lived directly east of the Square, in an area behind the County Courthouse, below – ironically – the Confederate Cemetery. During the 1950s and early 1960s, much of the social life of a boy in South Fayetteville centered on Jefferson Elementary, which offered a place to play when school was not in session. On one side of the building, it had playground equipment. On the other side were basketball hoops and a large blacktopped space for other games. Its lower field was a place to play baseball. 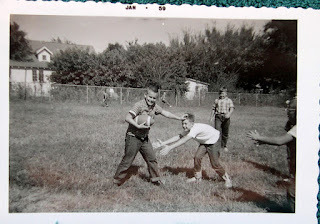 When the school’s playgrounds were full or not easily accessible, we used the numerous vacant lots located near our houses to play whatever games we wanted – touch football, whiffle ball, etc. 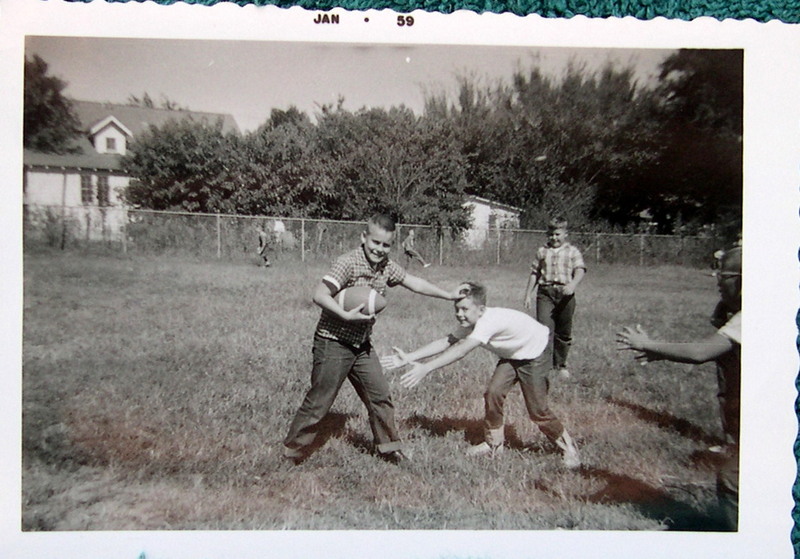 Playing in the Lower Field of Jefferson School, 1959. Student Larry Stout has the football; he is stiff arming Jimmy Hawkins. During those years, South Fayetteville was full of kids, the baby boomers. On my block of East 6th street alone, neighbor kids included (at different times) Bobby Carnes, Randy Allison, the Daily brothers, the Dockery brothers, Phyllis Jet, Sue Skelton, and others. Ronnie Cole and Steve Baucom lived a block to the west. Others within a short walking distance of Jefferson were the Eugene Tucker; Phillip Snow; Larry Stout; Bruce Walker; Philip Agee; the Ballard brothers; cousins Justin, Morris, and Beverly Daniel; Newt Land; Larry Schafer; and many others. One of the nice things about living in my part of South Fayetteville was that a couple of small neighborhood grocery stores – Hanna’s and Johnson’s Groceries -- were located by Jefferson School, selling staples such as candy, pop, and baseball cards. Also, as we got a bit older, we could easily walk up to the Square to go the Palace or Ozark Theater to watch a movie. Or we could go there to spend our allowance at one of the five-and-dime stores. 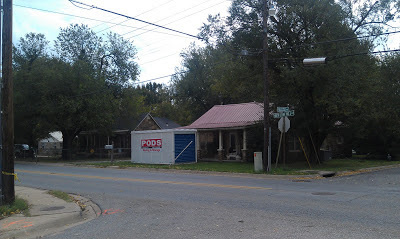 I was reminded of my days in South Fayetteville when I visited there recently, driving around the old neighborhoods. Surprisingly, it still looks much the same in many neighborhoods, with few changes on streets such as South College and South Washington. Most of the old houses are still around. Some have been refurbished and look much better than I remembered; others are more dilapidated. The area still seems to be full of modest houses for families living on a tight budget. The area now has fewer empty lots. Most have been filled by houses, mostly modest ones that fit comfortably in the surroundings. A few lots have been used for rental housing, much of it cheap, brick single story units with little landscaping or charm. The most obvious negative change is that Jefferson Elementary School is no longer a school. Young students have to leave South Fayetteville to attend elementary school. That means elementary school students in South Fayetteville can no longer walk to and from school; they no longer have the same easy ambulatory access to their friends and playgrounds after school (though Jefferson still operates as an adult and community education center and the lower field is still there). The most impressive positive change in South Fayetteville is the expansion of Walker Park, which is a now great asset for the area. It was a small neighborhood park in the late 1950s. At the time, it did not encompass the overgrown scrub land bounded by S. College Avenue, East 7th St. (then unpaved), the Town Branch, and East 15th St. That land contained lots of trees, but also had a large cleared area. At the time, someone had scratched out a rough baseball diamond on a part of the cleared land and put up a crude backstop. On weekends, South Fayetteville folks would crawl through a barbed wire fence to play baseball there. Now of course, the land has eight baseball parks, soccer fields, hiking trails, and other recreation amenities. One major change in South Fayetteville has occurred recently – most within the last year -- and I cannot decide whether it is something to be welcomed or whether it should be considered a threat to the future of the area. 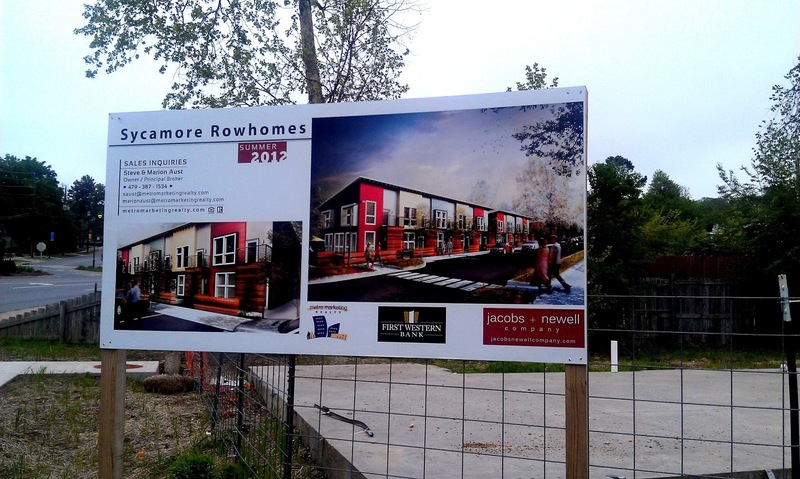 I am talking about the colorful multi-story townhouses and row houses being built in several South Fayetteville locations. Across 6th Street from Ronnie Cole's old house; These units face Block Ave. I could hardly believe my eyes when I first saw such a development last November. It is located on West 6th Street (now MLK Blvd) across the street from where Ronnie Cole lived, less than a block from where I resided for a decade. It is bounded by S. Block on one side and S. East St. on the other. This development, which is nearly finished, was built on a half block of land on which Ronnie’s grandparents had lived in a large country-style house. The present Google satellite photo (60 West 6th Street) still shows the old house and the large lot on which it sat. 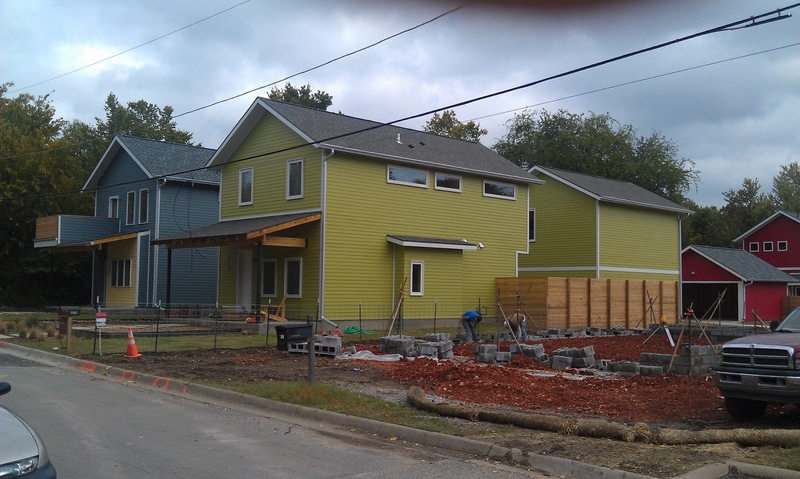 In November, 2012, builders had completed several new, brightly painted two-story single family houses, each with a tiny yard, and were working on others. 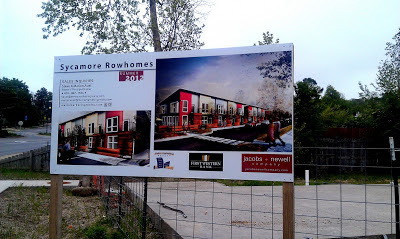 By April 2013, eight new houses had been built or were being finished. 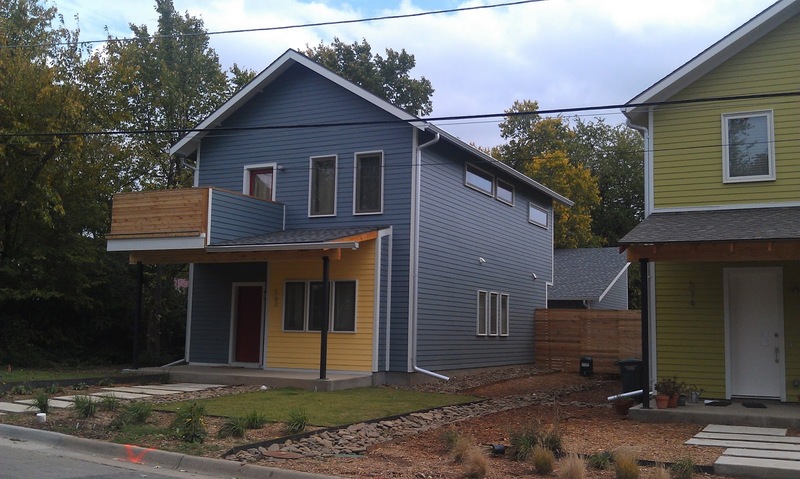 These houses have small porches, small balconies and fenced back yards. While moderately attractive, their size, colors, style and arrangement are unlike any other previously to be found in South Fayetteville. 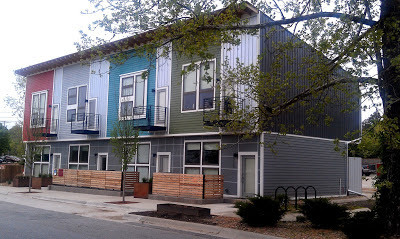 In Spring 2012, several similar units were also completed or near completion a block away at the corner of Block Ave. and W. 7th Street (across from an entrance to Walker Park). 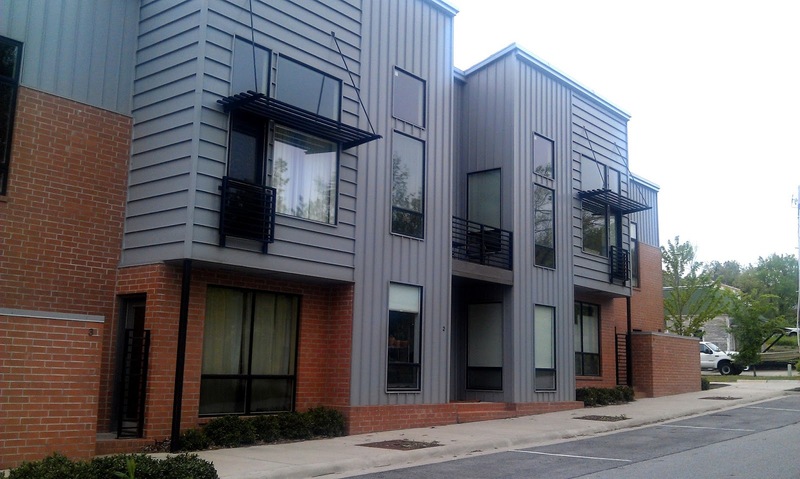 These units have a design similar to those on West 6th Street. These multi-story, modern houses were recently built on S. Church Ave. Some even more incongruous residential housing has been recently built a few blocks to the west on S. Church Ave.(see pictures above) between West 6th and West 7th Streets. 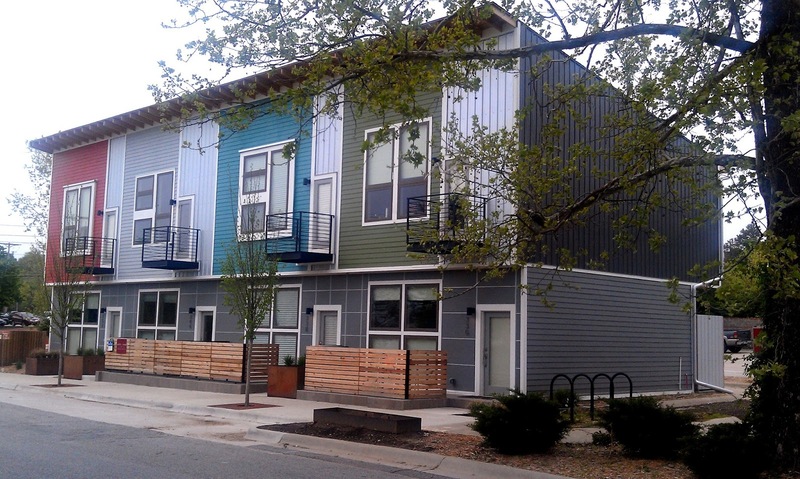 These units have a more modern and striking design than the new ones a block away on West 6th and 7th streets. They come in different heights (2 and 3 stories) and colors. Their roofs have unconventional angles and window size and locations are quirky. They are built more closely together, though each has its own small yard. 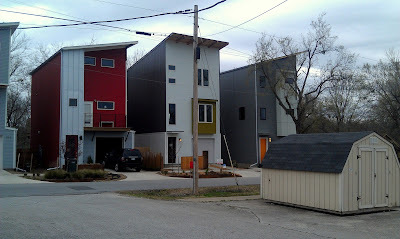 These attached units are located at the corner of Locust Ave. and W. 5th St.
A few blocks north of those houses, wrapping the intersection of West 5th Street and Locust Ave., some colorful row houses have been built (with some expressed intent to build more). Again, these designs are sleek and modern; the units are built of materials unlike those used in the traditional houses of South Fayetteville (see pictures above). These last two developments, on Church Ave and Locust Ave., fit more easily into their environments. While the neighboring dwellings to the east are mostly older, traditional modest wood frame houses, these housing units are located near busy S. School St. and commercial development to the west. As urban-style houses, they fit fine in a multi-land use setting. In truth, I like the vibrant design and colors of much of this new South Fayetteville housing, especially the single family units on Church Ave. Likely, they are not attractive to families with children because they have tiny yards and are too near a four-lane road with substantial traffic. However, I can see how childless professionals who want interesting space, a non-conventional design, and convenient location would find these units enticing. Also, I would guess that the units have some price advantages because the cost of the land on which they are built is cheaper than similar land in north Fayetteville. 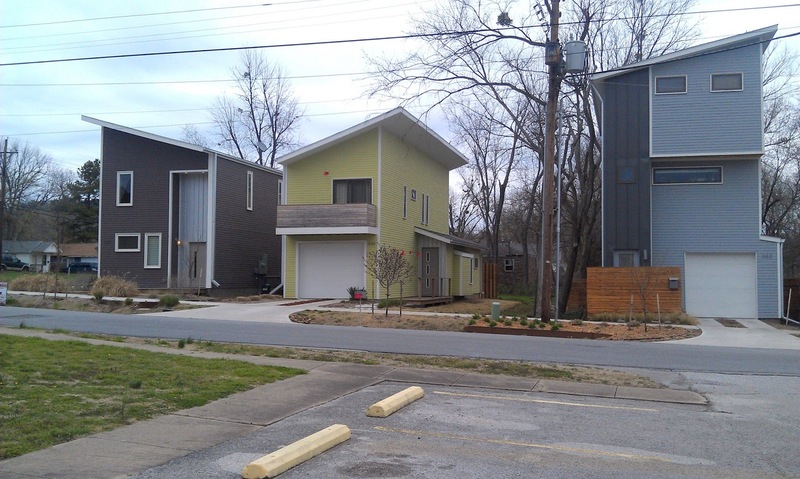 It will be interesting to see if the addition of these non-conventional units, so unlike the other houses in South Fayetteville, is the start of a transformation (gentrification?) of the area, or if they are simply a one-time opportunistic exploitation of low land prices to build reasonably priced for buyers who want more space at an affordable price. Check back in a year to see what has happened. Excellent article Dan. S. College Ave was also my stomping grounds in my early years and I have many memories of that area. I lived with my grandmother, your Aunt Rhetha, at the corner of 9th and S. College across from the driveway to the Walker house. Brian Walker would always wave when he pulled in. 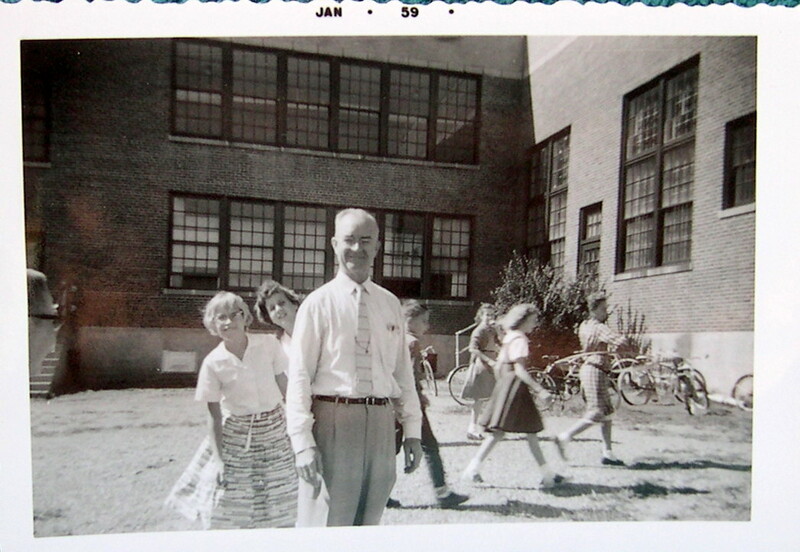 Like my dad did in the late 40's and early 50's I attended Jefferson school in the 70's from 2nd to 6th grade. At that time Hannas Store had closed and the Widow Hanna was still living and I would talk to her when she was out doing yardwork. Johnsons store was still open and I could always get some candy for a dime. I was a lil dismayed when I saw that Jefferson was no longer a elementary school, many good memories there on those playgrounds and the lower field. Walker Park was also a big part of my younger days, playin baseball and basketball and swinging. I always drive through the old neighborhood when I go to Fayetteville and get lost thinking about those long ago days. Thanks, David. I remember visiting your dad and aunt Rhetha many times when he was still in high school at their house on S. College, across the street from the Stouts. Of course, many other of our Durning family relatives lived south of Jefferson at different times, including Don and Vera, O.J. and Norma,and your great-grand parents Elias and Lilly. All of these folks were good-hearted, salt of the earth people. South Fayetteville was a good place to grow up.